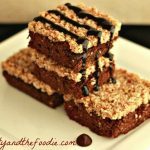 German chocolate brownies are a chocolate bownie layer with a coconut caramel pecan layer and a chocolate sauce drizzle layer. Paleo, primal with low carb options. Crazy goodness! ¼ Cup unsweetened almond or coconut milk. 1 Tsp organic apple cider vinegar. 3 tbsp cocoa powder or cacao powder, sifted. cup Sweetener of choice: 1/4 coconut sugar for paleo or for low carb use 1/4 cup eryrithitol. In a large mixing bowl combine: 3 eggs, ½ cup maple syrup of choice, ¼ cup milk of choice, 1/3 cup melted butter or coconut oil, 1/2 tsp baking soda, 1 Tsp apple cider vinegar. Mix together well. Add to the mixture in the mixing bowl: 1/3 cup coconut flour and 3 tbsp cocoa powder. Stir together thoroughly, scraping sides of bowl. Pour brownie batter into baking pan and spread around evenly. Bake at 350 F for 23 to 26 minutes or until center is set. While brownies are baking we can start making the coconut caramel pecan layer. Add to a food processor: ¾ cup pecans, ¼ cup coconut flakes, 1/4 cup sweetener of choice (coconut sugar or low carb eyrithritol), 3 pitted medjool dates for paleo, or for low carb use 20 drops stevia toffee flavor liquid option, and 3 tbsp water. Process for a few minutes until mixture has a course ground texture. Set aside. In a small sauce pan over medium low heat melt: 3 tbsp coconut oil and 2 tbsp coconut butter. Heat until melted. Add the pecan mixture from the food processor to the sauce pan with melted coconut oil and coconut butter. Stir and combine. Heat mixture on low and stir often for 4 minutes. Remove from heat and cool. Once brownies are done, remove from oven and let cool for at least 15 minutes or more. Once brownies have cooled, spoon the pecan mixture on top of brownie layer. Spread around, and lightly pat the mixture onto the brownie layer *don’t press hard and squish the brownies*. Once coconut caramel pecan layer is evenly layered on brownies, place pan in the refrigerator for 45 minutes, or you can put in the freezer for 15 minutes, if you can’t wait that long. Just don’t forget and let them become frozen (as if that could happen). Remove from fridge or freezer. Stir together all ingredients for the chocolate sauce, and drizzle over the top of the German chocolate brownies if you desire.